For pricing or to order direct, call 1-800-206-8381. Total costs for this product vary by insurance. Prescription for this product? Click here. Providers please Login to your account to order. To order this product direct without insurance: Register here. Edentulous Version for patients with dentures or missing teeth. The OraStretch Press Rehab System is a hand operated device that provides a simple option for jaw hypomobility and dysfunction. The OraStretch press successfully alleviates trismus from cancer, trauma, TMJD, facial burns, and stroke. Extended OraStretch press for improved fit of over-/under-jet patients. The OraStretch press retails for $498.00, however your actual cost can vary widely based on insurance coverage, deductibles, coinsurance, and other iss6ues. We do provide Medicare and insurance billing for the OraStretch press. We also have discounts for no-coverage, Medicaid, and more. Please call us for more information about pricing and ordering. brochures, prescription/order forms, practice guides, manuals, and recommended protocols. The OraStretch press jaw motion rehab system is a handheld unit designed to stretch a user's jaw to treat trismus, dysfunction and hypomobility. The device uses passive motion to stretch the user's jaw, joint and facial tissues for increased mobility, flexibility, and function. The OraStretch press device provides a curved, anatomically correct stretch for patients to treat or rehabilitate their jaw and temporomandibular joint. The OraStretch press can be used for stretching, passive motion, and muscle strengthening. By utilizing the OraStretch press, a user can increase their range-of-motion, improve their jaw and joint function, and reduct swelling and pain. With continual and diligent use of the OraStretch press, a typical patient can gain 1-2 mm per week in overall range of motion, with short-term gains of 1-4 mm immediately after stretching sessions. Use the OraStretch press daily as directed by your doctor. Your recovery depends on your commitment to rehabilitation and is the only way to assure yourself a full, functional recovery. The standard and pediatric versions come with bitepads that are 1/8" thick and stiff. 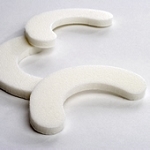 These foam pads work to hold the user's teeth in place while they are using the device. We also have edentulous pads for patients with dentures on the Standard version which can be directly used on the soft tissues of the mouth. Compared to other jaw motion rehab systems, the OraStretch press, opens 20% wider, is about 50% smaller and lighter, and patients don't have the continuing expense of replacement pads. Service Offers: See the details for the free replacement pads, free size exchanges, and warranty on our Offers and Details page. "My daughter began using the OraStretch press approximately two weeks ago. The therapist is using it 5 times a day during the week. She has experienced amazing results. Her initial opening measurement was 9 mm, and it is now measuring 21 cm. She is stunned at the improvement. Her speech therapist is also excited, as she had never before been exposed to the OraStretch press. She had stated that she will recommend it to other stroke patients, as the improvement is outstanding. Just wanted to let your company know that the results are outstanding. My daughter and I, as well as the rehab facility, are really excited with the improvement shown by this device." WARNING: IF YOU EXPERIENCE SHARP PAIN WHILE USING THE DEVICE, STOP USING IT IMMEDIATELY. If the pain persists or recurs, contact your doctor. *These are examples only. Users should consult with a medical professional for protocols specific to their conditions. Contraindications: Mandible or Maxilla bone fracture (upper and lower jaw); and other bone weaknesses, bone infections, osteomyelitis, and osteocradionecrosis of the jaw. The OraStretch press is clinically proven as more effective than self-exercises and tongue depressors. The press is easy to use and portable, allowing patients to perform their necessary therapy while continuing in their daily life. The OraStretch press has been used by thousands of patients suffering from trismus and jaw dysfunction, and may be able to help you. The OraStretch press includes the OraStretch press device, a patient log, a safety limit knob, foam bite pads, and measuring scales, all easily carried in the travel bag. The OraStretch press device itself includes the safety limit adjustment knob, which allows the patient and doctor to control the therapy and prevent overstretching. The OraStretch press device mouthpieces are softened by foam pads and spread the force of the stretch across the users teeth. Special pads are also available for edentulous patients. The OraStretch press has been studied and successfully tested in clinical trials of post-surgical and post-radiation trismus, TMJ disorders, and traumas. Recent studies also indicate efficacy for treatment of orofacial pain and non-surgical TMJ conditions. The OraStretch press foam pads and the Range-of-Motion scales can also be purchases separately without prescription. The OraStretch press should only be used under the guidance of a medical professional. Please see the Instruction Manual for more information, warnings, and usage instructions. The OraStretch® press is covered by some, but not all private insurance based on the individuals plan. We will work with you, your doctor and your insurance company to get the system covered. Visit our Insurance Page or contact us for more information this process. The OraStretch® press system has better coverage for Cancer and Post-Radiation patients. The OraStretch® press is covered by Part B of traditional Medicare. 80% of the cost is covered by Medicare, and the Medicare enrollee is responsible for the remaining 20%. Medicare Advantage plans are generally administered like private insurance policies, and OraStretch® press coverage is thus determined by the individual plan.